Employers are warned to be extra vigilant when recruiting new staff as the number of people being inaccurate or telling lies on their CVs and the sophistication of the lies they are telling reaches new heights. 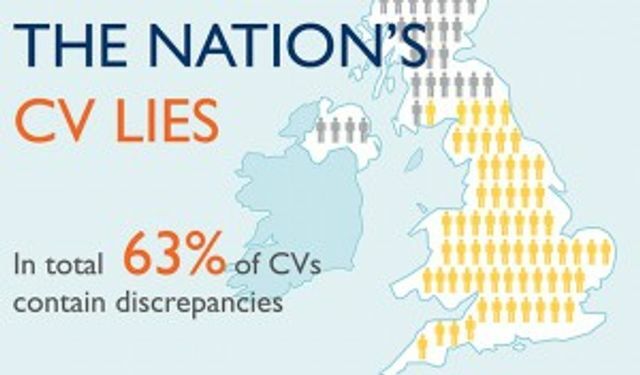 Analysis of 3,000 CVs by employee screening experts at The Risk Advisory Group has found that despite us revealing more about ourselves online than ever before, 63% of CVs contain discrepancies – a rise of 15% in the last decade*. Although men and women were equally likely to lie on their CV, it seems that 25 to 32 year olds are the worst offenders. 35% of discrepancies came from this age group, suggesting that the ambition of ‘Gen Y’ may be driving them to bend the truth.